The spare wheel is located in a well under the floor covering in the boot and is fixed in place with a special bolt » Fig. 136. Lift up the floor in the luggage compartment. Remove the box with the tool kit. Unscrew the nut » Fig. 136 anticlockwise. 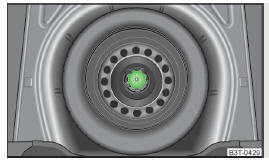 Place the wheel into the spare wheel well with the wheel rim pointing downward. Replace the box with the tool kit into the spare wheel and secure it with the tape. Fold back the floor in the luggage compartment. Install a wheel of the appropriate version and dimensions as soon as possible. A yellow warning label is displayed on the rim of the temporary spare wheel. Please note the following if you intend to use the temporary spare wheel. The warning label must not be covered after installing the wheel. Be specially attentive when driving. The temporary spare is inflated to the maximum inflation pressure for the vehicle » Fig. 133 on page 152. Only use this temporary spare wheel to reach the nearest specialist garage since it is not intended for permanent use. Never drive with more than one spare wheel mounted! Never use the temporary spare wheel if it is damaged. If the dimensions or design of the temporary spare wheel differ from the fitted tyres, never drive faster than 80 km/h (or 50 mph). Avoid accelerating at full throttle, sharp braking and fast cornering. Observe the instructions on the warning sign of the temporary spare wheel.